The Finder Darts Masters 2016 were held from December 9 till 11. 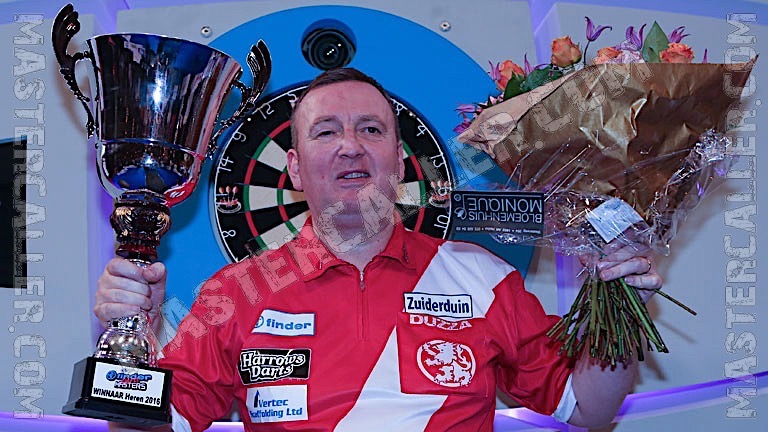 Glen Durrant managed to retain his Finder Darts Masters title in 2016. This year he defeated Jamie Hughes in the final. Durrant faced a tough group with the likes of Tony O'Shea and Madars Razma, but he defeated both 5-2. In the quarterfinals he was much better than the 2015 finalist Martin Adams, defeating him 3-0. In the semi-final he overcame Scott Mitchell 3-0 and in the final Durrant became the 2016 champion by beating Hughes 5-3. Jamie Hughes reached the final as an unseeded player by beating Geert de Vos in the semi-final and veteran Martin Phillips at the last eight. The only Dutch player who survived the group stage was Wesley Harms, but he lost to De Vos in a thrilling quarterfinal: 2-3.